WASHINGTON, D.C. — U.S. Treasury Secretary Steven T. Mnuchin and Office of Management and Budget (OMB) Director Mick Mulvaney today released details of the fiscal year (FY) 2017 final budget results. The deficit in FY 2017 was $666 billion, $80 billion more than in the prior fiscal year, but $36 billion less than forecast in the FY 2018 Mid-Session Review (MSR). As a percentage of Gross Domestic Product (GDP), the deficit was 3.5 percent, 0.3 percentage point higher than the previous year. Growth in spending outpaced growth in tax receipts for the second year in a row as a result of historically subpar economic growth. Rising deficits show that smart spending restraint and pursuing policies that promote economic growth, like tax reform and reductions in regulatory burden, are critically necessary to promote long-term fiscal sustainability. “These numbers should serve as a smoke alarm for Washington, a reminder that we need to grow our economy again and get our fiscal house in order. We can do that through smart spending restraint, tax reform, and cutting red tape,” said Director Mulvaney. Year-end data from the September 2017 Monthly Treasury Statement of Receipts and Outlays of the United States Government show that the deficit for FY 2017 was $666 billion, $80 billion higher than the prior year’s deficit. As a percentage of GDP, the deficit was 3.5 percent, an increase from 3.2 percent in FY 2016 and above the average of 3.1 percent over the last 40 years. The FY 2017 deficit of $666 billion was $63 billion greater than the estimate in the FY 2018 Budget (Budget), and $36 billion less than estimated in the MSR, a supplemental update to the Budget published in July. Note: Detail may not add to totals due to rounding. Government receipts totaled $3,315 billion in FY 2017. This was $48 billion higher than in FY 2016, an increase of 1.5 percent, below expectations from both the Budget and the MSR. As a percentage of GDP, receipts equaled 17.3 percent, 0.4 percentage point lower than in FY 2016 and 0.1 percentage point below the average over the last 40 years. The dollar increase in receipts for FY 2017 can be attributed to higher social insurance and retirement receipts and net individual income taxes, partially offset by lower deposits of earnings by the Federal Reserve. Outlays grew in FY 2017, but by less than expected in the Budget and the MSR, and decreased slightly as a percentage of GDP. Outlays were $3,981 billion, $128 billion above those in FY 2016, a 3.3 percent increase. As a percentage of GDP, outlays were 20.7 percent, 0.1 percentage point lower than in the prior year, but above the 40-year average of 20.5 percent. Contributing to the dollar increase over FY 2016 were higher outlays for Social Security, Medicare and Medicaid, and interest on the public debt. In addition, one-time upward revisions in estimates of credit subsidy for outstanding Federal loans and loan guarantees, primarily in the Departments of Education and Housing and Urban Development, increased outlays relative to FY 2016 by $55 billion. Lower spectrum auction receipts and higher spending by the Federal Emergency Management Administration for hurricane relief and recovery also contributed to the increase. Total Federal borrowing from the public increased by $498 billion during FY 2017 to $14,667 billion. The increase in borrowing included $666 billion in borrowing to finance the deficit, partly offset by $167 billion related to other transactions that on net reduced the Government’s financing requirements, such as changes in cash balances and net disbursements for Federal credit programs. As a percentage of GDP, borrowing from the public declined from 76.7 percent of GDP at the end of FY 2016 to 76.3 percent of GDP at the end of FY 2017. Below are explanations of the differences between estimates in the MSR and the year-end actual amounts for receipts and agency outlays. Total receipts for FY 2017 were $3,314.9 billion, $28.7 billion lower than the MSR estimate of $3,343.6 billion. This net decrease in receipts was primarily attributable to lower-than-estimated collections of deposits of earnings by the Federal Reserve, other miscellaneous receipts, and corporation income tax receipts. Table 2 displays actual receipts and estimates from the Budget and the MSR by source. Individual income taxes were $1,587.1 billion, $3.2 billion higher than the MSR estimate. This increase is the net effect of higher withheld payments of individual income tax liability of $2.7 billion, lower nonwithheld payments of $1.7 billion, and lower-than-estimated refunds of $2.2 billion. Corporation income taxes were $297.0 billion, $5.4 billion below the MSR estimate. This difference reflects lower-than-expected payments of 2017 corporation income tax liability of $3.2 billion and higher-than-estimated refunds of $2.2 billion. Social insurance and retirement receipts were $1,161.9 billion, $1.0 billion lower than the MSR estimate. This reduction is the result of lower-than-estimated deposits by States to the unemployment insurance trust fund of $1.0 billion. Excise taxes were $83.8 billion, $3.7 billion below the MSR estimate. Estate and gift taxes were $22.8 billion, $0.4 billion below the MSR estimate. Customs duties were $34.6 billion, roughly equal to the MSR estimate. Miscellaneous receipts were $127.7 billion, $21.5 billion below the MSR estimate. Lower-than-expected deposits of earnings by the Federal Reserve accounted for $10.3 billion of this decrease relative to the MSR. The remaining decrease was attributable to lower-than-expected collections of various fees, penalties, forfeitures, and fines. Department of Defense — Outlays for the Department of Defense were $568.9 billion, $9.9 billion lower than the MSR estimate. This difference is mostly due to lower-than-expected outlays for operation and maintenance, which were $7.8 billion less than the MSR estimate. Operation and maintenance disbursements were less than anticipated for Army contracts from FY 2016 and prior years, reimbursements from the Coalition Support Fund, and Defense Health Program and counter-ISIL “train and equip” contracts. Additionally, outlays were lower than expected by $1.5 billion for Army military personnel, $1.4 billion for revolving and management funds due to lower-than-expected fuel costs, and $1.0 billion for disbursements against aircraft procurement contracts. These differences were partially offset by $2.2 billion of higher-than-expected outlays for research, development, test, and evaluation. Department of Education — Outlays for the Department of Education were $111.7 billion, $1.8 billion higher than the MSR estimate. This difference was driven by outlays for higher education programs. In the Pell Grant program, outlays were $0.9 billion higher than projected in the MSR, due to faster-than-expected disbursement patterns. For the Federal Direct Student Loan program, because of changes in the mix of activity in direct student loans, $0.7 billion more in positive subsidy outlays for the FY 2017 loan cohort were recorded in FY 2017 than estimated in the MSR. Department of Health and Human Services — Outlays for the Department of Health and Human Services were $1,116.8 billion, $11.8 billion lower than the MSR estimate. Outlays for Medicaid spending were $3.8 billion less than projected at MSR, driven primarily by lower benefit expenditures than was anticipated during the second half of the year. National Institutes of Health (NIH)’s outlays were $1.5 billion lower than projected, due in part to lower-than-expected disbursement for research grants in the fourth quarter of the fiscal year. The Service and Supply Fund (SSF) outlaid $0.9 billion less than expected at MSR. SSF expected higher outlays in FY 2017 mainly due to an anticipated increase in contracts serviced; however many of these contracts will be outlaid starting in FY 2018 instead. Outlays for the Public Health and Social Services Emergency Fund (PHSSEF) were lower than expected due to procurements that occurred much later in the fiscal year than originally planned. Department of Homeland Security — Outlays for the Department of Homeland Security (DHS) were $50.5 billion, $2.2 billion lower than the MSR estimate. Outlays in a number of DHS components were below the MSR estimates. Outlays for Customs and Border Protection were $1.4 billion below the MSR estimates, due to slower-than-expected spending for procurements and construction for customs enforcement and border protection infrastructure projects. Outlays for the National Protection and Programs Directorate were $1.2 billion lower than the MSR estimate, due to slower-than-expected outlays of the agency’s cyber budget. Outlays for the Transportation Security Administration were $0.9 billion lower than the MSR estimate, due to slower-than-expected outlays from obligations for airport security construction projects. Partially offsetting these decreases, outlays for the Federal Emergency Management Agency were $2.0 billion higher than the MSR estimates because of response activities related to Hurricanes Harvey and Irma. Department of Justice — Outlays for the Department of Justice were $31.0 billion, $3.4 billion lower than the MSR estimate. This difference is primarily due to payments from the Assets Forfeiture Program being $2.3 billion less than estimated in the MSR. Also contributing to the overall difference was higher-than-expected receipts from fines and penalties, which were $0.7 billion higher than the MSR estimate. Outlays were $0.5 billion lower than the MSR for programs within the Office of Justice Programs partially due to pending litigation. Outlays were also lower across many other programs due to delayed action on FY 2017 appropriations. Department of Labor — Outlays for the Department of Labor were $40.1 billion, $3.6 billion lower than the MSR estimate. Nearly $2 billion of this difference is attributable to lower-than-projected unemployment insurance benefit outlays because the actual unemployment rate was lower than assumed in the MSR economic forecast. Another $1.5 billion of the difference is attributable to the Pension Benefit Guaranty Corporation (PBGC), due to both gross outlays being less than expected and offsetting receipts being greater than expected. The majority of the change in outlays is related to lower-than-expected payouts in the single employer program. PBGC also anticipated a substantial investment loss in FY 2017, but experienced a profit, leading to much higher offsetting receipts than anticipated in the MSR. Department of State — Outlays for the Department of State were $27.1 billion, $3.0 billion lower than the MSR estimate. Outlays were lower than expected for Department of State foreign assistance programs by $1.6 billion, mostly due to lower-than-anticipated spending for Global Health Programs, which was driven primarily by a delay in lump sum payments to the Global Fund to Fight AIDS, Tuberculosis, and Malaria. The delay was necessary due to a shortfall in confirmed statutorily required matching payments from other donors. In addition, lower-than-expected outlays for capital-intensive programs such as new overseas facility construction and delayed payments for contributions to international organizations and peacekeeping were primarily responsible for the remaining difference of $1.3 billion from the MSR estimate. Department of Transportation — Outlays for the Department of Transportation were $79.4 billion, $2.2 billion lower than the MSR estimate. Nearly $0.9 billion of this difference is due to lower-than-expected outlays for highways and transit programs. Most of the remaining difference is an accumulation of lower-than-expected spending across a number of programs. Late-year congressional action on FY 2017 appropriations delayed grant-making and hiring activity across the agency. 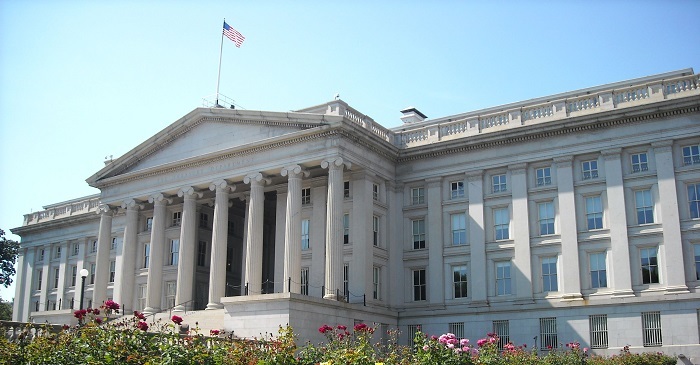 Department of the Treasury — Outlays for the Department of the Treasury were $546.4 billion, $17.3 billion lower than the MSR estimate. Virtually all of the difference is due to interest on the public debt, which was $16.4 billion lower than the MSR estimate. Interest on the public debt is paid to the public and to trust funds and other Government accounts. The difference is the result of lower-than-projected interest paid to the public on inflation-indexed securities and other marketable Treasury securities, as well as lower-than-projected interest paid to Government accounts. International Assistance Programs — Outlays for International Assistance Programs were $18.9 billion, $4.1 billion lower than the MSR estimate. This difference is largely due to net outlays for Department of State Foreign Military Sales that were more than $3 billion lower than the MSR estimate due to higher-than-anticipated receipts received from foreign governments for weapons purchases. Social Security Administration — Outlays for the Social Security Administration were $1,000.8 billion, $1.7 billion lower than the MSR estimate. The difference, which is relatively small in comparison to total program outlays, is primarily attributable to lower-than-expected outlays for the Disability Insurance Trust Fund and Supplemental Security Income programs. United States Postal Service — Net outlays for the United States Postal Service were -$2.2 billion, $5.5 billion lower than the MSR estimate. Outlays were lower than the MSR estimate due largely to the failure of the Postal Service to make required payments for health and pension contributions. Railroad Retirement Board — Outlays for the Railroad Retirement Board were $5.2 billion, $1.7 billion lower than the MSR estimate, due largely to the National Railroad Retirement Investment Trust’s unrealized gains and losses on investments. Actual returns to the Trust were much higher than projected in the MSR due to favorable market conditions in the last few months of FY 2017. Undistributed Offsetting Receipts — Undistributed Offsetting Receipts were -$236.9 billion, $6.6 billion higher than the MSR estimate. Net outlays for interest received by trust funds were $3.0 billion higher than the MSR estimate (lower net collections). The difference is due largely to the interest earnings of the Military Retirement Fund, which were $4.2 billion lower than the MSR estimate, partly offset by higher-than-projected interest earnings in some other programs. This intragovernmental interest is paid out of the Department of the Treasury account for interest on the public debt and has no net impact on total Federal Government outlays. In addition, receipts for employer share, employee retirement were $2.5 billion higher than MSR estimates (lower net collections) primarily due to the failure of the Postal Service to make required accrual payments to the Postal Service Retiree Health Benefit Fund. The estimates of GDP used in the calculations of the deficit and borrowing relative to GDP reflect the revisions to historical data released by the Bureau of Economic Analysis (BEA) in July 2017. GDP for FY 2017 is based on the economic forecast for the President’s 2018 Budget, adjusted for the BEA revisions.